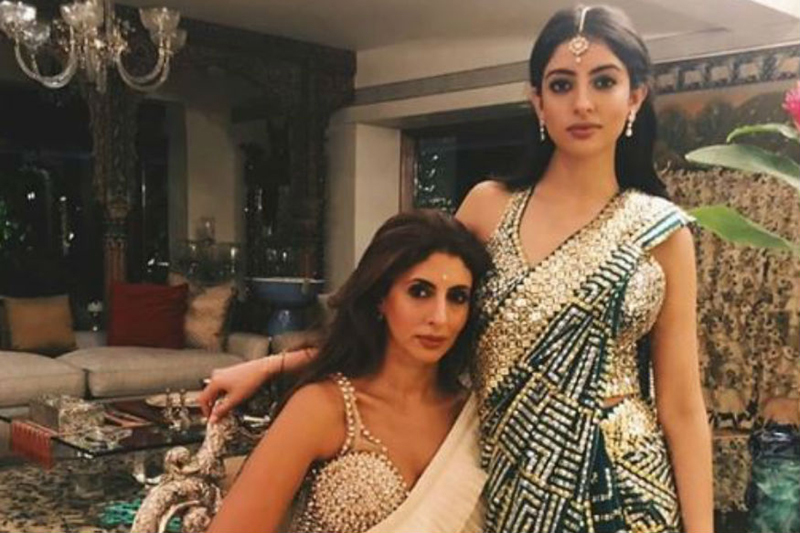 Shweta Bachchan Nanda and Navya Naveli Nanda stole the show with their stunning looks. Take a look. Akash Ambani and Shloka Mehta's engagement ceremony on Saturday was a star-studded affair with the who's who of B-town among other celebrities in attendance. From Shah Rukh Khan, Gauri Khan, Aishwarya Rai Bachchan, Abhishek Bachchan, Alia Bhatt, Ranbir Kapoor, Aamir Khan, Rekha to Rani Mukherjee, Mira Rajput Kapoor and Shahid Kapoor, everyone turned up at the bash dressed to the nines. But among the galaxy of stars who descended at the bash, two women who actually stole the show were mother-daughter duo Shweta Bachchan Nanda and Navya Naveli Nanda. The two beauties looked mesmerising in Abu Jani-Sandeep Khosla ensembles, exuding grace, elegance and sophistication all at once. While Shweta Bachchan Nanda stunned in a ivory saree with ruffles details at the hem and pallu teamed with an embellished corset-style blouse, Navya looked like a dream in an emerald green saree featuring gotta-patti work. The two beautiful ladies rounded off their look with minimal accessories and perfect makeup.